BCBG Max Azria Alton moto jacket (we love this one too), Cynthia Rowley eyelet skirt (last worn here), Mossimo sleeveless blouse, Zara waffle knit sweater (similar here), Forever 21 knit beanie (similar here), Express fingerless gloves, Merona Kailey ankle boots (also seen here), GG&L S/S 2014 NI K.O. bag (sample). Lauren's look is the perfect example of how fashion is constantly "breaking the rules." No white post-Labour Day? Please. Winter whites are my new favorite thing, especially when worn head to toe like Lauren is doing here. And I love how she keeps it interesting with plum colored fingerless gloves and this metallic George Gina and Lucy bag. 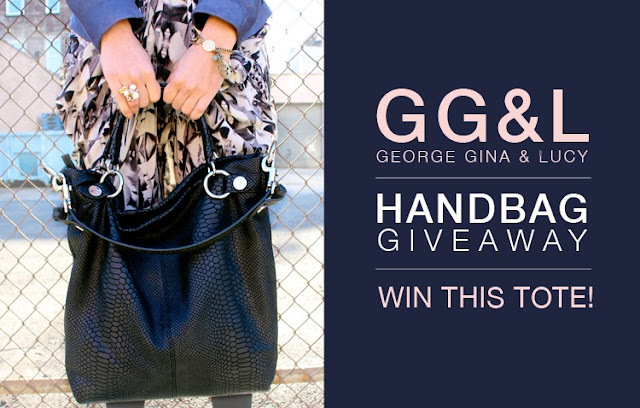 Also, if you hadn't yet heard, we're giving away the below GG&L S/S 2014 tote to one lucky reader for the holidays! Want it to be yours? Click on the image below or head here to enter to win. I love that look! If someone can pull off an all-white look it's always a win in my book. Also I adore the fingerless gloves with this outfit! I love an all white look! This is fabulous and I love the beanie as well. A very sophisticated wintery look! Great look and I am loving gloves! Chic white look. You nailed it with all the different textures and layering. Love the all white. So chic and fresh! You look amazing. So pretty all in white! Love this neutral look, it is gorgeous. Such a great take on winter whites! Oh! Wow, I do adore that jacket! It is so fantastic and you layered it wonderfully over your outfit! Love the black and white! Absolutely wonderful in all white! I love the layering of all the pieces together! *stunning* i really love how you paired the white with the black tights. so chic! This all white outfit looks so chic! All of the textures of layers look amazing together!